Dallying In The Dirt, Issue #214--- A magnificent Disocactus produces great beauty from ugly stems. I bought the lawn fertilizer yesterday and I should have applied it. It rained last night and now probably won’t for several days. Granular fertilizer without rain is just a bunch of granules. Things are happening fast and furious in the garden now. We waited, less than patiently, for the air and soil to warm up and now that it has, there is a backlog of chores to accomplish. It is still a strange season. The Witch Hazel has just started to bloom and it looks like most of the flower buds are not going to open. Some perennials such as Hosta have barely started to show above ground. Many bulbs have resisted making an appearance. Spring, from those indicators, appears to be a couple of weeks late. On the other hand, the soil in the warmer part of the vegetable garden is dry, warm and workable and it’s just the middle of April. I have been planting furiously. Most of the early direct seeded vegetables, Peas, Spinach, Swiss Chard, White Turnips and some Beets are now in the ground. I’ve also planted half of all of the early transplants. 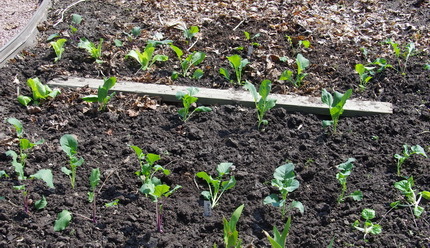 The Pak Choi, Kohl Rabi, Broccoli, Cabbage and Cauliflower are among the cool season crops that are now in the ground. Why did I only plant half of them? I should have made notes last year, paper ones because my mental ones seem a bit incomplete. What plants did the rabbits enjoy last year. I don’t remember them eating all of those cole crops so I planted half of them in the area that is not fenced. I’m saving the other half to plant behind the fence in case those nasty bunnies devour the first half. Fencing the whole garden is just not an expense I’m prepared to make this year. They have survived one day and night already so it’s looking hopeful. The Peas and Spinach are well behind the fence. The rabbit trap is working well it has caught 4 squirrels so far. Amazing things are still happening indoors. Huge red flowers have appeared on a plant that came inside last winter with such eaten, beat up looking stems that I considered throwing it out. I knew it was a cactus but was unsure of its name and until it started flowering this week, I really had minimal interest. It apparently is a Disocactus and probably one of the many hybrids of this genus. In nature the species is epiphytic, hanging from the branches of bigger trees. Mine sits in a small clay pot with a very well drained sandy soil. It gets thoroughly ignored most of the time and when I remember to water it the pot has started to tip over because the slightly heavy strap shaped leaves have overbalanced the soil and pot because the lack of moisture in the pot has left it very light. Despite, or probably because of, this rather harsh treatment, it has decided to throw out these magnificent blooms. I’ve counted about 14 flower buds. Each one stays open for only 3 - 4 days. 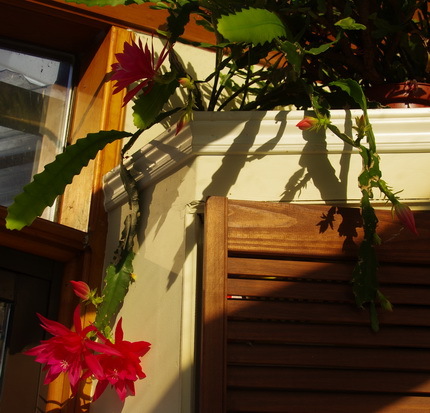 Disocactus really are those houseplants that thrive on neglect. The Crocus are in full bloom. The Tulips and the Narcissus are starting to show above the soil and the upcoming bloom period is looking late but good. I admit to being worried. The 250 new Narcissus that I planted on the berm have made a minimal appearance. All that work can’t be in vain, can it? I console myself with the fact that they are on the north side of the berm and thus the soil is warming up more slowly. They certainly are not going to make an appearance at the garden club’s Narcissus show next Wednesday. I spent considerable time, last fall, cleaning up behind that berm and planting a new shade tree. The idea is a shady wildflower garden. On my trip to the local Sheridan Nursery this week, I noticed this rack of plants in the parking lot. They had obviously just been delivered. It was a wide selection of native plants, including three different Trillium, some wild Ginger and Jack in The Pulpit among several others. I inquired about their price, basically a delaying tactic because I was already loading a selection onto my cart. They came home and were transplanted into larger pots because that space behind the berm is just not ready for them yet. I really do have minimal self control when I’m let loose in a garden centre in the spring. The Assistant Gardener was gracious enough to admire them and allow as how they should do well when their space is finally ready. Linda Asks? This cold winter has left some of the yucca I look after with white leaves, mostly in the centre part. I am a volunteer at the Fairgrounds gardens and these are exposed to the weather, straw mulched. Should all the white leaves just be cut off? Second question: I start our leek and onions under grow lights. When it is time to plant they are 4-5 inches tall but the bulb-root end small. It is like planting hair. They grow well and we get great veggies but I wish I had seedlings like you can purchase that are more substantial. I have tried planting less in a box, has not really helped. Should I try cutting the tops back to see if the other end gets bigger? Ken Answers! Be patient or lazy with the Yucca. Wait to see what grows and and cut off the rest. Most of the new growth will come from centre and the roots. To get bigger transplants of onions etc all you can do is start them earlier. Mine are started around the middle of February. If they get very lanky I will give them a haircut and they always get a haircut on planting day to make them easier to handle. They also get to move to the cold frame for a couple of weeks before planting out and the extra light seems to fatten them a bit.